Real money online blackjack has evolved. Just a few years ago you could have enjoyed some standard rules games online, perhaps with a bonus side bet alongside. Developments in both hardware and software have now improved both the experience of playing and the variety of titles, ten-fold. You can now play on mobile devices, enjoy live dealer streamed games and choose from a long list of variations and blackjack-themed games. This site gives you all the information you need on online blackjack. Here you will find strategy primers ranging from the basics through to advanced card counting techniques. You will also find information on the most reputable casinos, for both US and international players. With information on everything from game variants, compatibility with your computing devices and even payment options we have your real money blackjack needs covered. It is important to memorize some simple blackjack strategy concepts before you hit the tables. By making the best decisions, you can reduce the house edge to a tiny 0.5% in some cases. If you make mistakes you would be giving a much higher edge than that to the casino. Fortunately, basic blackjack strategy is easy to memorize – with the just your score and the dealer’s visible card the key factors to account for. You will find everything from beginners blackjack tips, advice about taking the insurance side-bet – though to how to use blackjack strategy charts here. In theory, counting the high and low cards which have been dealt can give the advantage in this game to the player. Known as ‘card counting’, this activity is not illegal – though the casinos do not like it and will ask anyone they catch doing it to leave. Over the years, card counting techniques have become advanced. You will find guides on this site to take you through many of the most popular methods. These range from the original Hi-Lo Count though to the Uston advanced count and Hi-Opt 2 system. When it comes to playing blackjack, online or in land-based play, there are hand types and payouts to expect. 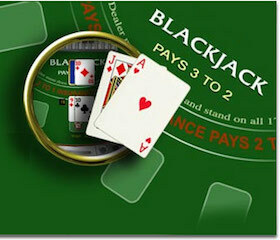 Blackjack payouts commonly are set at 3 to 2 but you can sometimes find 6 to 5 payout options. The payout you receive can be dependent on the hand played. Blackjack hands are categorized into four areas; hard hands, soft hands, hands that can be split and hands that you can double down on. It is important to learn more about blackjack hard vs soft hands, double down and split so you know what to do in every instance. Learning the difference between the hand categories can mean the difference between a payout or a bust. When looking at blackjack hard vs soft hands, a hard hand will be one without an ace and only one total can be produced. With a soft hand, an ace is used and can be considered one point or eleven-point card. Online blackjack is completely legal, with many reputable offshore casinos providing games to US players, and international gambling giants covering the rest of the world. You’ll find a huge choice of games online nowadays, ranging from the simple US or European games to some complex variations. You will find reviews of some of the most reputable offshore casinos on this site. The single biggest US casino is Bovada.lv. This operator is part of the Bodog family and has been welcoming US players to their Real Time Gaming powered suite of casino games for many years. Alternative US casinos include the colorful Loco Panda, which offers giant bonuses for new players – and Drake Casino, which are powered by the innovative BetSoft suite of games. International players have a huge choice of casinos, including those offered by the global gambling brands based Europe. International players can check out the award-winning Mr. Green casino, which is powered by NetEnt software. This casino works entirely through your browser, with no download required. Mobile blackjack is a popular choice among online gamblers as they can take their favorite games on the go. When you play blackjack mobile, you can enjoy the game anywhere you have an internet connection. Most casinos offer a mobile version of the game because players often want to use tablets or Smartphones to log in and play blackjack. Easily play blackjack for real money with your mobile device via top online casinos! When it comes to online gaming, you can easily play online blackjack for fun online as well as for real money. Online casinos will offer demo versions of blackjack games which you can play to get a feel for the game, without having to deposit funds. Demo versions are a great way to see how the games work and feel comfortable at the online casino. You can use the demo to practice online blackjack before wagering real money, learning how to play the game correctly before the betting begins. Anytime a casino offers free gaming, especially with blackjack, be sure to take advantage of it! A new generation of streamed live-dealer games is also coming online. You’ll be playing using real cards from a remote studio – usually hosted by an attractive and personable young lady. In most ways, it’s the same as sitting down at a land-based casino and playing a few hands of blackjack, but you never have to leave your house. Blackjack is one of the most popular games enjoyed online today and online table rules are easy to understand, making it easy for you to learn how to play online blackjack casino games. Step 1 – Choosing Bet Amount: To begin, you will need to choose the amount of money you wish to wager. Commonly, blackjack games will offer betting amounts of $1, $5, $25 and $100. Step 2 – Dealing Cards: Once you choose your wager, you will be ready to choose the ‘Deal’ button. Once ‘Deal’ is chosen, the cards will be dealt. Step 3- Playing Blackjack: Once the cards are dealt, you can choose to Hit, Stand or Double Down. If you are dealt a pair, then you can choose to Split. Step 4 – Payout: Once the action has been chosen, the software will deal the cards to the players involved and the dealer. The hand will then finish and if you win, your money will be paid, or your bet taken based on the outcome of the hand. Step 5- New Game: For the next hand, you can choose re-bet with the same amount or you can choose the next wager to be less or more than the previous one. There are literally 100’s of variants of the original game based out there, something that would never have been thought possible during the earliest days of blackjack history. The main games are known as the US and European rules. In the US game, the dealer will peek at the down card to check for blackjack where the up card is a 10 or ace. In the European rules, the second card only comes after the players have acted. This means US players will know when the dealer does not have a blackjack at the start of the hand – which in turn makes a difference to the best strategy. Some variations involve changing the decks. For example, Spanish 21 does not include the 10’s, and California Blackjack has jokers added. There are other games, like Pontoon, which use different words for the actions, for example, ‘Stick’ instead of ‘Hit’. The most entertaining variations of all have taken the basic game and added completely new elements to this. Blackjack Switch gives you 2 hands and allows the top cards to be swapped between them. Blackjack Surrender allows you to give up on a hand and forfeit half of your stake if things do not look favorable. 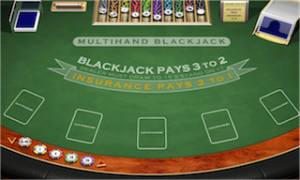 There is even a game which combines casino poker with blackjack – in the form of Ante Up 21. When it comes to playing online, you have several blackjack casino deposit options. Online casinos make it easy for you to deposit funds to play your favorite blackjack games. Blackjack with PayPal deposit is perhaps the easiest way to place funds in your player account. When you have a PayPal account, your funds are transferred instantly, providing you with quick cash to play online. A Skrill casino for blackjack is another easy to use method to deposit funds. Simply sign up for a Skrill account and choose this method in the Cashier for deposit. Additional deposit methods can include Visa, MasterCard, Neteller and more which you can find on our online blackjack deposit options page. Blackjack casinos in Las Vegas offer the best blackjack variations for real money game play. Las Vegas blackjack rules are standard, so if you know how to play the game, then you are good to go. The best casinos for real money blackjack in Vegas will offer tables with five to seven seats with Insurance paying 2 to 1. The dealer must Hit Soft 17 and must stand on All 17s. While in Vegas, look for unique games at top casinos so you can enjoy the game of blackjack in a different way! Check our playing blackjack in Las Vegas page for more information.